Langley, Okla. – Hellgrammites, mayflies, damselflies, dragonflies, caddisflies, leeches and fish all share a common home, the water. 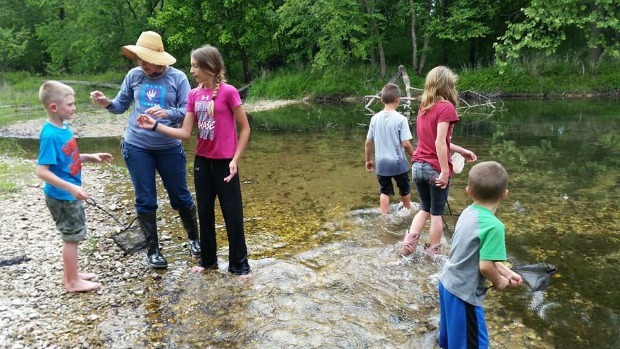 The Grand River Dam Authority (GRDA) and the Oklahoma Conservation Commission’s Blue Thumb program are partnering this summer to help educate kids about how to protect these aquatic dwellers, and the water we drink and recreate in. They are hosting A Grand Adventure! Lake and Stream Youth Day Camp for kids aged 9 – 13, July 30 – 31, 2015 at the Grand Lake Ecosystems and Education Center located at the Pensacola Dam in Langley. The purpose of the camp is to help educate kids about water quality and what can be found just below the surface. Campers will get a tour of the dam, learn the difference in monitoring a lake and a stream, check water clarity, better understand how stormwater runoff affects streams and rivers, seine for fish and build and launch their own miniature raft to study water flows. “When you take kids to a stream or lake and let them explore, they learn more than we think. We will give them the tools they need to explore the world under the water and to protect one of Oklahoma’s most precious natural resources, water,” said Cheryl Cheadle, Blue Thumb State Coordinator. This is the first water quality camp GRDA has offered, but partnering with the Blue Thumb Program, whose staff has experience working with youth and conducting summer camps, seemed like a perfect fit. This year they are offering one two-day camp, but hope to expand it to two sessions next year. If your camper wants a preview of what camp will be like, stop by the GRDA Ecosystems building on Sat. June 27th from 10 – 3 to visit with the Blue Thumb staff, make a fish print, learn how erosion affects water quality and register your camper. The cost to attend the camp is $25 and each child will receive a life-jacket, small net, t-shirt, lunch and snacks. To register visit http://agrandadventure2015.eventbrite.com/or for more information, contact Jeri Fleming at 405-334-6343 or [email protected].